The book’s new edition (second edition) is now available. 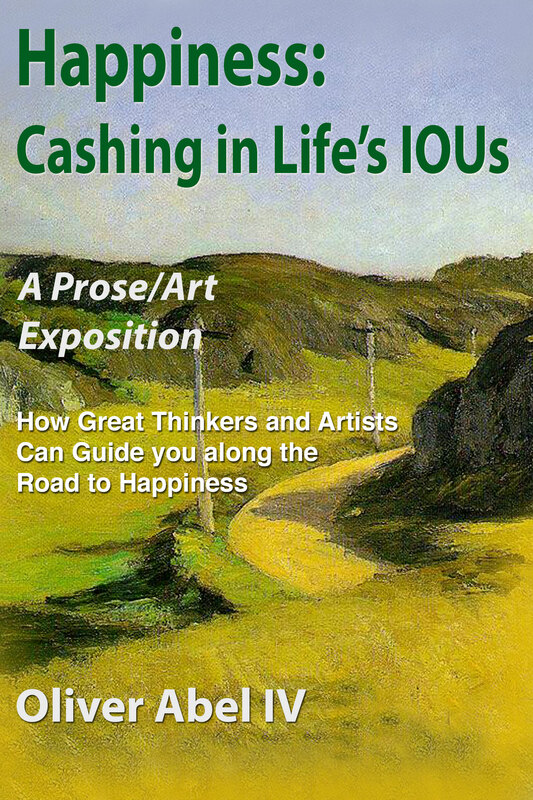 This second edition expands the “Prose/Art” Exposition to seven galleries from six. It adds 12 new works of art to further explain the seven galleries. While the focus of the book has been and continues to be about finding the road to happiness in this life, it now includes a brief discussion of the road to happiness as expressed by the world’s five dominant religions. You will find two aspects of the world religions’ roads to happiness in this life interesting: 1) they basically agree on the road to finding the “good life” (friendships, family love, self-esteem, prestige, financial comfort) and they agree on what happiness looks like when you reach it, but they disagree on the road to take from the “good life” to happiness, and 2) Christianity is the only one of the dominant religions with a Twofold Happiness – one road for this life and one road for the next life. I think that you will find the new edition not only helpful in finding your own road to happiness, but perhaps enlightening regarding the various faiths of the world. I hope you will download the book and enjoy the journey! This entry was posted in Uncategorized and tagged happiness, happiness in next life, new book, religion on October 30, 2014 by oliver. Let’s discuss now look at the three theological virtues mentioned in my last post as necessary for the attainment of happiness in the next life. First up, Faith. According to St. Aquinas, Faith is a gift of knowledge of specific truths, revealed by God. Faith is also a venture into an unknown through accepting the truths that cannot be understood with our own natural faculties. Faith could be viewed as the theological extension of the philosophical virtues of wisdom and courage, required to accept the call to Adventure. Faith is that additional virtue from God that better reveals the call to adventure and the fortitude to accept it summons. Campbell teaches of the hero’s reliance on “supernatural aid” occurring at several points in the hero cycle. The first time occurs when the hero is departing for the adventure and may need the assistance of a “supernatural aid” to make the crossing. The supernatural figure represents a benign protective power of destiny. It represents reassurance of a promise that Paradise will not be lost. The helper is often viewed as a guide or a teacher, or in Christianity, the Holy Spirit. This “supernatural aid” most closely resembles the theological virtue of Faith. Up next, the virtue of Hope! This entry was posted in Uncategorized and tagged faith, happiness in next life, st. aquinas, twofold happiness on September 19, 2014 by oliver. Continuing from my previous post, the “twofold happiness” expressed by St. Aquinas is a very creative and constructive means to help us better understand what ingredients are needed in this life (philosophical elements) versus those required for the next life (theological elements) to reach happiness. As I have mentioned in previous posts, attaining happiness in this life requires assistance from the four cardinal (philosophical) virtues: wisdom, courage, moderation, and justice. These natural virtues are held in common by Aristotle, The Stoics, and St. Aquinas (and to some extent by Epicurus) as essential to human happiness in this life. These same virtues are expressed artistically in the works seen in the galleries of the exposition in my book. St. Aquinas teaches that attaining happiness in the next life (beatitudo), however, requires assistance from three theological virtues: faith, hope, and charity. These three virtues cannot be acquired by human effort. These virtues are gifts from God. However, they are not foreign to this life: they are an extension of the virtues required in this life and a further perfection of happiness, only available in the next life. As such, “twofold happiness” requires the cardinal virtues for happiness in this life and the theological virtues for happiness in the next life. It is this “twofold” happiness that is the ultimate goal of Western believers. This entry was posted in Uncategorized and tagged happiness in next life, st. aquinas, twofold happiness on September 15, 2014 by oliver. In my previous post I mentioned that I was going to focus now on the road to happiness in the next life as expressed in Christianity. However, Christian teachings commingle the road to happiness in this life with the road to happiness in the next life. To understand this better, let’s return to one of the four ancient philosophers, St. Aquinas. This time we will study his philosophical teachings (regarding this life) and his theological teachings (regarding the next life). St. Aquinas teaches that there exists a “twofold happiness” that is available to all of us. One is the happiness that we have been discussing up to now. This is the happiness achievable in this life by our own human efforts. However, St. Aquinas adds that there is a second happiness, a happiness that cannot be achieved simply by human effort without divine supernatural assistance. This is a happiness not in this life, but in the next life. St. Aquinas calls this happiness in the next life, beatitudo (blessedness). St. Aquinas goes on to mention that the idea of twofold happiness should not be thought of as involving two distinct goals of human life with different roads to follow. He states that the second happiness, happiness in the next life, should be considered as a kind of surpassing perfection of the first. In other words, the second road to happiness (in the next life) is commingled with the first road to happiness (in this life). This entry was posted in Uncategorized and tagged happiness in next life, st. aquinas, twofold happiness on September 12, 2014 by oliver.